Elmer’s smugness, his bike racer swagger, was backed up by his speed. 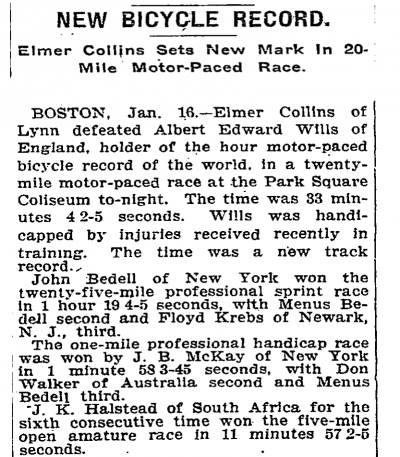 He beat the world record holder in a motor-paced race at the Park Square Coliseum in 1909. BOSTON, Jan. 16. 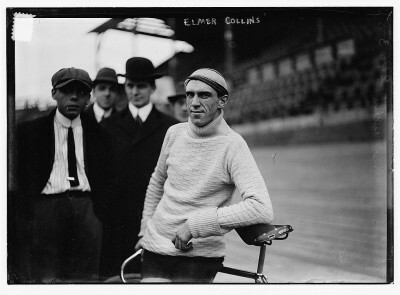 – Elmer Collins of Lynn defeated Albert Edward Wills of England, holder of the hour motor-paced bicycle record of the world, in a twenty-mile motor-paced race at the Park Square Coliseum to-night. The time was 33 minutes 4 2-5 seconds. Wills was handicapped by injuries received recently in training. The time was a new track record. His sweater, cap, brooks saddle were stylish then and now. Take his look, add a pink swatch, and you could sell it at Cross races today.